The north end of Bainbridge Island has Seabold Hall; central Bainbridge has Island Center Hall and the Filipino American Community Hall; Winslow has the Camp Yeomalt scout cabin. 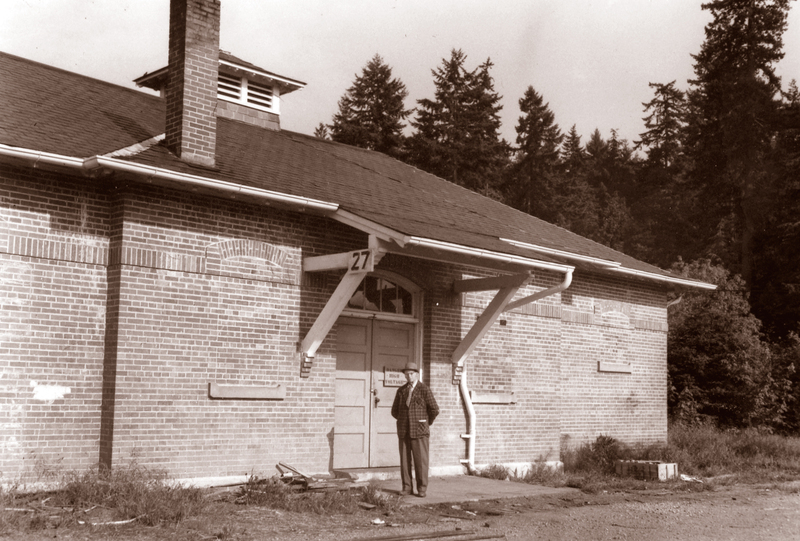 Every Bainbridge Island ward has a historic building restored for use as a community hall – except the south end. Now the Fort Ward bakery building offers the perfect opportunity to give south Bainbridge a historic hall of its own. The bakery building was constructed with the rest of Fort Ward around 1910. The original plans from the National Archives show rooms devoted to flour and other baking supplies, with the central area home to large ovens where soldiers on kitchen duty baked the bread that would keep the fort’s garrison well fed. The Bakery Building after World War II, when it was converted into a power station. Some of the windows were bricked over, but the distinctive rooftop cupola was retained. Later, during World War II, the building was converted into a power station to supply elec tricity to the fort’s many buildings. Some of the windows were bricked over and various changes were made to the interior, including a raised floor and reconfigured rooms. The bakery was sold off when the fort was surplussed by the federal government around 1960. It eventually became a private residence. Configured as a community hall, the building would have an occupancy of around 50 people. A local architect volunteered his services and drew up plans for community uses including meetings and neighborhood celebrations. The Bainbridge Park District is partnering on the project, and will manage the community hall through an interlocal agreement with KCSD7 once the restoration is complete. The Fort Ward Youth Advisory Committee, comprised of high school students in the Fort Ward neighborhood, is leading the outreach campaign, and earned the City of Bainbridge Island’s 2015 Blakely Award for Historic preservation for their efforts. The bakery building is now listed on the federal, state and local historic registers, and the restoration project will ensure that it carries the story of Fort Ward history into the future, and gives Bainbridge youths, families and community groups a place to gather and hold events for years to come. We are also developing partnerships with local schools to bring students into the Fort Ward neighborhood to learn about local history in this dynamic environment. The Fort Ward Community Hall and its interpretive displays will be the centerpiece of this interactive setting, a district that includes many historic buildings, abandoned fortifications, archival photographs, artifacts and rich lore. For decades, Fort Ward defended our country. Now it’s our turn to defend Fort Ward. We’re counting on you to help.